فاجعه پنبه تراریخته در هند. اگر می خواهید دروغ های مافیای تراریخته در باره مزایای پنبه تراریخته را بدانید این مقاله را حتما مطالعه کنید. GM Bt cotton in India has brought stagnant yields, massive pest attacks, and increased agrochemical use, according to data presented at a conference. GMO advocates often claim that GM Bt cotton was responsible for increased cotton yield in India. But while yield did increase for the first few years of Bt cotton introduction, this gain was not sustained. And the data show that even this temporary gain was not due to Bt cotton. During the years when cotton yields grew, from 2002–۲۰۰۵, the percentage of Bt cotton in the total cotton crop was minuscule – below 6% at the all-India level. 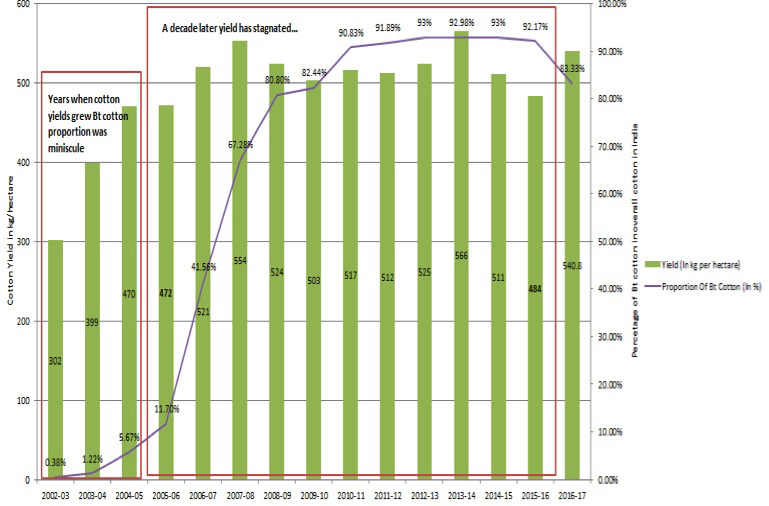 As the percentage of GM Bt cotton in the total cotton crop grew to over 90%, yields stagnated and even declined (see graph below). Data are from India’s Central Institute for Cotton Research (CICR), the central government’s Cotton Corporation of India, and the ministry of agriculture. So what caused the temporary yield gain during the early years of Bt cotton introduction? A report by Dr K.R. Kranthi, former director of the CICR, showed that the cause was not improved yield from the GM crop but massively increased fertilizer use – see the chart below. Data are from CICR and the ministry of agriculture. The unique selling point of GM Bt cotton is that it has a built-in insecticide. This is claimed to reduce the need for farmers to spray chemical insecticides. But the data show that while GM Bt cotton did initially reduce the need for insecticide spraying, this trend did not last. Now farmers are spraying as much insecticide as they did before Bt cotton became widely grown (see chart below). The increase in sprayed insecticides has been forced on farmers by the fact that Bt cotton has fallen victim to attacks from pests such as whitefly and pink bollworm. 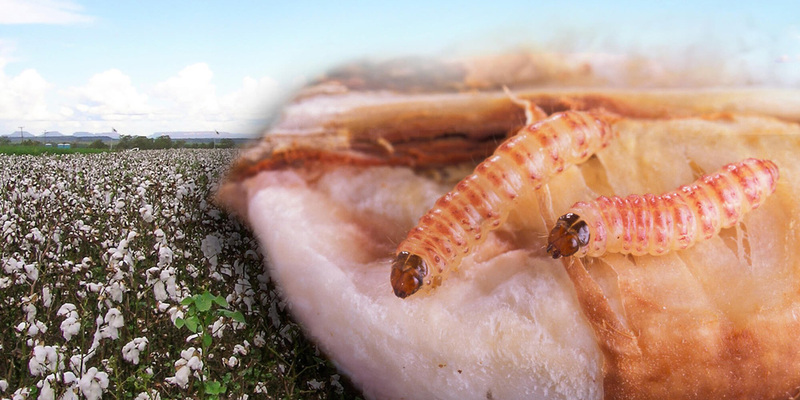 The bollworm is the pest that the Bt toxins in Bt cotton was supposed to kill. But instead the pests are feeding – and thriving – on the crop. These data are not new and some have featured in other publications, including a report by the US anthropologist Glenn Davis Stone. However, they were newly collated and presented at the GMO-Free Regions conference in Berlin in early September by Kapil Shah of the Jatan Trust, a nonprofit that promotes organic farming and is based in the state of Gujarat. 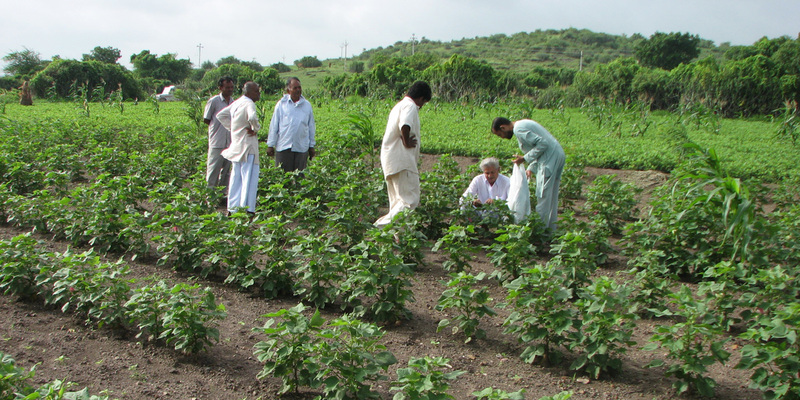 Kapil Shah of Jatan Trust (right in the picture) with organic cotton farmers. They are collecting insects for the farmers’ education. Mr Shah showed a remarkable video of GM Bt cotton being ginned in Gujarat two years ago. The machinery is swarming with bollworms extracted from the cotton plants. Even when Bt crops are effective in killing pests in the first years of introduction, the built-in insecticide in these crops amounts to far more insecticide than the chemical insecticide displaced. So Bt crops don’t reduce or eliminate insecticides, they just change the way they’re used. And Bt toxins are not harmless, as GMO lobbyists claim, but have harmful effects on non-target insects and even mammals. There are signs that Indian states have learned lessons from its experience with GM Bt cotton. 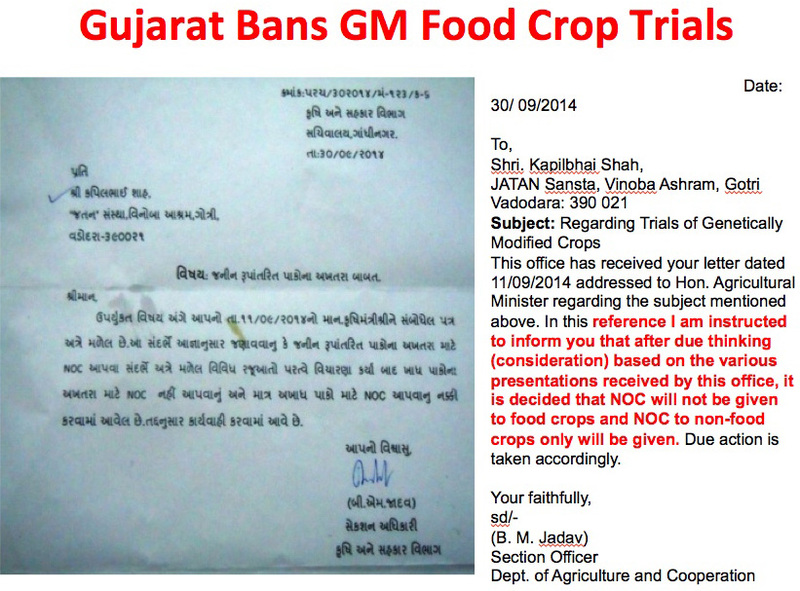 Most states are not giving permission to companies to conduct GM crop trials and Gujarat has actively banned GM food crop trials (see the slides below from Mr Shah’s presentation). However, the discovery of illegal GM herbicide-tolerant cotton in Indian fields and the presence of unapproved and unlabelled GMOs in foods sold in Indian supermarkets shows that regulators are failing in their duty of care to protect the Indian public.